Summertime is for road trips. Atlas Obscura teamed up with All Things Considered to travel up the West Coast, from California to Washington, in search of "hidden wonders" — unique but overlooked people and places. One morning a few weeks ago, René Corado was so excited that he forgot to eat breakfast. That day, two antique cabinets were to be delivered to an unremarkable building in an exurban office park in Southern California. It's home to the Western Foundation of Vertebrate Zoology, where Corado works as the collections manager. Primary among the nonprofit's holdings of natural history objects are about 1 million eggs, representing more than half of all known species and spanning from the present to some 200 years ago. It's one of the largest collections of bird eggs anywhere in the world. And it was the eggs in those newly delivered cabinets — an estimated 1,200 — that stoked the 52-year-old Corado's excitement. With steady hands, Corado extracted a mottled, off-white golden eagle egg — meticulously emptied of its contents through a single, tiny hole — from one of the drawers and began to scrutinize it carefully. He was looking for a "set mark," a minuscule notation that connects the egg to a data card indicating the collector's name, the species and when and where the egg had been taken. The actual cards are missing for many old collections, like this one, which dates to the early 1900s and was donated by the elderly son of the collector. This is where Corado comes in. With his encyclopedic knowledge of eggs and their collectors — down to recognizing their handwriting — Corado fills in the missing pieces. He wants to give each egg a birth certificate and a life story. Only then, he says, "they are born again to scientists." "It's just like detective work," he says, "and I'm so excited because I'm finding all the data." In fact, it turns out that the foundation's archives include notes from other collectors that referred specifically to eggs in this collection, providing some of the missing data. And it's these data, contained in these pristine relics, that have given a new relevancy to eggs that could have languished, irrelevant, as forgotten museum collections or the trinkets of privileged men, the remnants of an obscure and now obsolete pastime. The eggs, many of which were collected from the mid-1800s to about 1940, provide an invaluable baseline for researchers studying a wide range of subjects, from avian populations' genetics, behavior and physiology to environmental and climate change. "Egg collections are similar to libraries, holding a great amount of information about the biology of birds, and about their past, including from areas which have already been destroyed or largely altered by human activities," says Miguel Angelo Marini, an ornithologist from the University of Brasilia, who used the collection in his study of the breeding habits of neotropical birds. The Western Foundation is "a precious institution," he says, which holds "a rare and almost unique collection of the traits and history of birds from all over the world." Researchers are able to access the vast resources at the Western Foundation's cavernous, 22,000-square-foot space in Camarillo, Calif., about halfway between Los Angeles and Santa Barbara. Inside, there are 900 chest-high metal cabinets, topped with some 1,800 preserved birds and nests. Naturalist, wildlife photographer and egg collector Ed Harrison founded the Western Foundation of Vertebrate Zoology in 1956. Egg collecting had been particularly popular in the Victorian era, when museums and individuals traveled the world to collect specimens: from bean-size hummingbird eggs and fabulously speckled, spattered, strangely conical murre eggs to the few surviving gargantuan elephant bird eggs. Egg collectors tended to be men of leisure. Some, naturalists and ecologists, were careful and mindful of the impact they had. Others, with a more commercial bent, were indiscriminate, hoovering up islands' worth of eggs at a go and putting species at risk. As a conservation ethic grew in the early 20th century, and with the passage of the Migratory Bird Treaty Act in 1918, egg collections fell out of favor. By midcentury, natural history museums had begun setting their collections aside and even neglecting their upkeep. Harrison saw an opportunity to provide a home for orphaned collections, with the idea that scientific advances might one day make them useful again. It didn't take long for that instinct to be proved right. Bird eggs played a large role in sounding the alarm about the use of the pesticide DDT, as embodied in the 1962 publication of Rachel Carson's book Silent Spring. As scientists began to link the use of DDT to the thinning of bird eggs and the decline in certain avian populations, historical collections became critical for comparison. The brown pelican, for example, was heavily affected by DDT. The Western Foundation has hundreds of sets of brown pelican eggs from the 1800s to 1950s — in other words, before the DDT era. The ability to measure the thickness of old eggshells, and identify the presence of DDT in more recent, thinner specimens, sealed the case against the pesticide, which was banned in the United States for most uses in 1972. And the staff grew as well, to include a gardener from Guatemala — named René Corado. Together with Linnea Hall, a biologist and the foundation's director, Corado has helped lead the Western Foundation for more than 15 years. 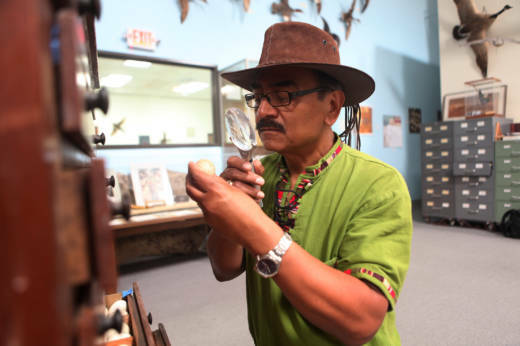 But he traveled a long and difficult path from gardener to collections manager, from Guatemala to Camarillo. It's a story he had never told anyone until one day in 2002. In 2002, Hall and Corado were on a flight to New Orleans for a conference as Tropical Storm Isidore approached the Gulf Coast. Corado thought the plane would crash. So he began telling the story of a childhood that he had kept secret — from his wife of 30 years, from his kids — for decades. Corado was raised in El Chical, a village of just 13 houses, about a third of the way from the headwaters of Guatemala's longest river, the nearly 300-mile Motagua, to its outlet on the Honduras border. One of eight children, Corado lived in rural poverty before his family moved to Guatemala City — where things grew worse. Corado told Hall of how he rooted through a trash dump for food, fighting dogs for scraps. He eventually persauded his father to let him work as a lustrador, a shoeshine boy. It was a world of drugs and dissolution, a position of particular shame, Corado says. "That was the nightmare in Guatemala. Really, I wasn't a kid; I was an adult already at the age of 8," he says, looking particularly childlike for a man of 58, "but I learned a lot." In 1981, as the Guatemalan civil war intensified and fearing for his safety, Corado left his wife and young daughter and crossed the border to the United States. He spoke no English, had no friends, no papers and a sixth-grade education. He held many jobs, from welding cabinets to cooking in a Greek restaurant — and eventually found work, and a mentor, at the Western Foundation. Ed Harrison must have seen potential in the gardener who ate his lunch quickly so he could sit near biologists and eavesdrop on conversations he could barely understand. Harrison helped him learn English and sent him on research trips. Corado became a U.S. citizen in 1986, graduated first in his class from high school, and in 2007 earned an associate degree from nearby Oxnard College. All the while, Corado was building his knowledge of the egg collection. After hearing Corado's story, Hall insisted that he write a book about his life. They worked on it for a decade or so, as they collaborated on ornithological research in Southern California and in Guatemala, on the Motagua. And in 2001, Corado's past and the Western Foundation's future intersected, when he returned to his home village for the first time in more than 30 years. Instead of the clean river of his youth, the Motagua had become an open sewer for communities and industries lining its banks. After the initial shock, he says, he dedicated himself to cleaning up the river. And as with DDT, eggs would play a key role. Corado and Hall collected and tested the eggs of species along the river, including those eaten by locals. They found alarming levels of heavy metals in the eggs — and by extension, they argued, in people who were eating these birds (and fish from the river). They sent the research to government agencies in 2009; there was little response. But a couple of years later, Corado's book, El Lustrador, was published in Guatemala — and became a hit. His newfound fame earned him an audience with President Jimmy Morales, where Corado discussed his findings with the Guatemalan leader. Corado's influence and friendship with the president — along with a lawsuit filed by the government of neighboring Honduras — have led to a law mandating cleanup of the river, planned wastewater treatment plants, closure of a landfill that was draining into the river, and other, ongoing efforts. "It's a circle," Corado says, "and the circle closed." The Guatemala research has spurred changes — and made even plainer the value of the Western Foundation's vast resources. And that's part of Hall's vision for the foundation: to bring it out of the shadows and engage in current conservation research "to show that studying eggs and studying birds' breeding still has relevancy in this day and age." Ornithologists like John Bates, who is also a curator at the Field Museum in Chicago, are using the Western Foundation's collection in research about climate change. His project examined historical egg specimens to determine that some birds in the Chicago area are laying their eggs earlier, probably as a result of rising temperatures. He knew that he wouldn't find all the eggs he needed in his museum's collection, so he turned to the Western Foundation. And Corado, the gardener turned ornithologist, is the perfect long-term caretaker of what Bates calls a "spectacular data set." Corado is "intimately connected to every specimen that's in this museum," Hall says. And that connection has made him more than a steward. He's a booster, a sleuth, one of the keys to unlocking the collection's full potential. "My job here is to protect all of this," Corado says. "I love every single one, and more or less I know where everybody is. I'm keeping an eye on them like every good father will do." Samir S. Patel is deputy editor of Atlas Obscura. Maureen Pao edited the Web story. Dylan Thuras, a founder of Atlas Obscura, Matt Ozug, Renita Jablonski and Michael May reported, produced and edited the audio story.